Looking for a Marks & Spencer’s student discount? We Student Discount Squirrel can help. Unfortunately there is currently no M&S student discount. However, this fantastically comprehensive guide will show students that they can still save money. Firstly there is now a huge M&S sale with discounts of up to 70%. While quality knickers and pants comes at a price, the Student Squirrel is here to show you how you can save money on your purchase. In this guide there is a contents box below so if there is a specific section that interests you then click on it an you’ll quicky scroll to that section. Does Marks and Spencer Do a Student Discount? Is there M & S Unidays, NUS or Student Beans Discount? 1. Does Marks and Spencer Do a Student Discount? Unfortunately we can confirm that there is no Marks and Spencer student discount in 2018. That means there is no Unidays, NUS Extra, Student Beans membership or any other student discount scheme in the UK. Check out our savings section at the top of the page which is regularly updated with the best sales, offers and code. 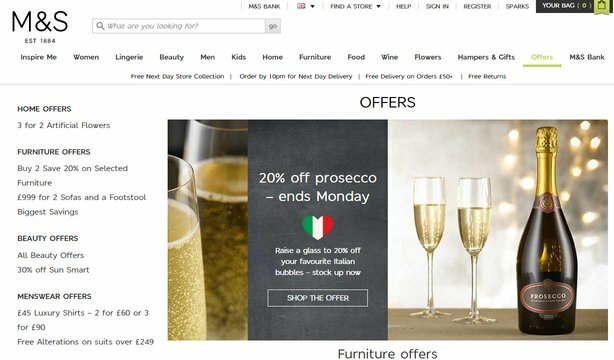 Head to the M&S offers page, where the latest deals on clothing, food and furniture are promoted. Sign up to the newsletter for special deals. There are still plenty of other ways to save so read on for more great Squirrel hints, tips and savings tricks! 2. Is there a M&S UNiDAYS, NUS or Student Beans discount? Now there are lots of student offer website in the UK and it can be confusing finding the reductions that students are entitiled to. The 3 biggest ones are NUS, UNiDAYS and Student Beans and each of them have a different offering. We get asked a lot whether there is a Marks and Spencers student discount through these schemes so we’ve done some extensive researching so we can answer your questions properly! Marks & Spencer Unidays Discount? Unfortunately there is currently no M&S Unidays student discount code (correct as of September 2018 ). But don’t worry, you savy uni savers can still save at this UK department store extraordinaire. Firstly check out our useful savings section which lists all the current voucher codes, offers and deals to save you money. Also, did you know that there is a bespoke offers page on marksandspencer.com which has some great ways to save. Marks & Spencer NUS Discount? As there is currently no M&S student discount, then there is no Marks and Spencer NUS code, or NUS Extra reduction for that matter. That’s a shame but don’t worry, have a look above about fantastic ways to save. Are there M&S Student Beans Discounts? Again, there is no association between Student Beans and M&S This would make things easier for students but it’s still possible to save. The Marks and Sparks savings don’t stop there though students. Read on to get some more excellent savings tips! So throughout the year M&S release promo codes with reductions and offers such as 10% off, free delivery and more. These code are usually live from between 1-2 weeks and you have to be quick to use them. Using the codes are easy, just do your shop on marksandspencer.com, get to the check-out and enter the code and the relevant reduction or offer will automatically be applied. M&S go big on Black Friday and Cyber Monday and typically have 50% off hundreds of lines. This is a great time to buy gifts for the parents or even to treat yourself to some new undies! There are some big sales on around Christmas. Marks and Spencer typically start online before Christmas Day with up to 50% off. Then around Christmas Day and Boxing Day they introduce more lines and even increase the discounts. Around mid March M&S have a mid-season sale and also something for Easter too. There are a good number of items with up to 50% off. The British institution that is Marks & Spencer, now more commonly known as M&S, can be found on almost every high street on the UK and is considered a beacon of quality and service. Selling clothes, homewares and luxury food products, it may not necessarily be the first brand you think of when it comes to considering student-friendly brands, but M&S is so legendary – and so widely available – that you may be surprised by what you can find in-store. 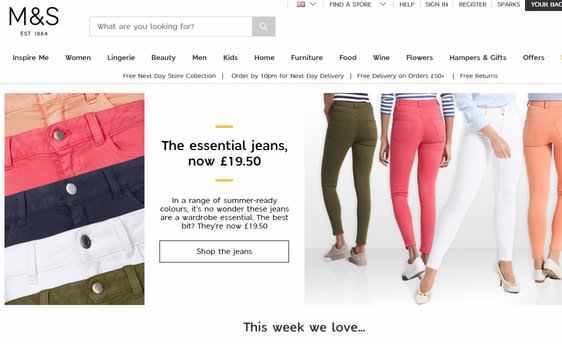 Now an all-encompassing retailer stocking clothing for menswear, womenswear and kidswear, beauty products, homewares, furniture, food, wine, hampers and gifts, there’s not much you won’t find either in an M&S store or on their website. Stores vary in size but there are some large flagship stores as big as department stores in key locations, as well as standalone M&S Food shops in a number of transport destinations such as airports and railway stations. The M&S Food stores sell a premium range of ready-to-eat and ready-to-cook products and, of course, the classics: wine in sealed plastic glasses, Percy Pig sweets and Colin the Caterpillar birthday cakes! Larger stores include click and collect facilities, order points for delivery, Bureau de Change, banking services and in some locations, even beauty salon services. Of 970 stores in the UK, over 600 are food-only; a great indicator of their rising popularity. Having now achieved international acclaim for its product range and service, M&S stores can be found worldwide and mirror the same classic British quality you’ll find here at home. M&S isn’t the first destination you may consider when going shopping, but there’s bargains to be had if you know where to look. M&S food is heavily reduced toward the end of the day, so nip in half an hour before closing time and browse to stock up. Most stores don’t have a dedicated clearance section, so you’ll need to look through the normal shelves and fridges to spot the tell-tale yellow labels for money-off. The Two Dine for £10 promotion happens every few weeks, running from a Thursday to a Sunday, and offers a main course, side dish, dessert and bottle of wine for a tenner – a great value meal for when you fancy something a bit special with your partner, best friend or housemates. Seasonal sales take place throughout the year at the usual times, but keep an eye online for an ongoing stock clearance section. Most of M&S’ customers are of the ages 40+, so you may find that the styles of clothing you’re into don’t sell well in-store and are discounted once pulled as a result. It’s always worth keeping an eye out! M&S is a classic British high street brand and one you’ll definitely have heard of, even if you don’t often use it yourself. It’s the perfect place for gifts, roping your parents into buying you stuff, or just for those occasions where you fancy a posher ready meal than normal! Consisting of a main course, side dish, dessert and bottle of wine (or soft drink option), the Two Dinner for a Tenner is one of M&S’ most popular offers and happens every few weeks, running from a Thursday through to a Sunday. It’s worth getting in early to get the best pick of the dishes, but main courses often include a chicken to roast, a pie (meat or veg), gastro pub dishes and a vegetarian option. Desserts include fudge cake, a cheese board, key lime pie and profiteroles. Can we take them all? YES! This beautiful bouquet makes for the perfect gift to a loved one in the post, no matter the occasion. It arrives either early in bloom or still in bud so that your recipient can enjoy the flowers for as long as possible. This is no small bouquet either; it includes 3x green bloom chrysanthemums, 3x cerise germini, 3x yellow germini, 3x pink roses, and 1x purple statice, all wrapped up in tissue paper and with the gift message of your choice! M&S was founded by a partnership between Michael Marks and Thomas Spencer in North Yorkshire. Mars, a Polish refugee, moved to the UK and started work for a company called Barran, in Leeds. In 1884, Marks launched a penny bazaar on Kirkgate Market in Leeds and hired Spencer as his first cashier. Five years later, a permanent stall was acquired and the partnership formalised. The stall moved to Birkenhead Market in 1901 and grew to a business with numerous market stalls around several markets. In the early 20th century, the stalls only sold British-made goods (a policy which it later moved away from), which proved very popular with consumers. Shops began to open across the country and the firm went from strength to strength. The focus was on quality products and the reputation for this along with great service found favour with the British public. In 1960, the brand expanded overseas and opened its first Asian stall in Kabul, Afghanistan. This was quickly followed by store openings in Canada and across Europe. Today, M&S is a household name and considered a British institution. Percy Pig sweets are a student favourite… and long may that continue! Marks & Spencers’s is a firm high-street favourite and it’s easy to see why. No longer somewhere your granny would be seen shopping this retail big hitter it’s re-establishing itself with a young crowd. Check out the page regularly for updates and sales news! Or just treat yourself to some of their lovely food yum yum! It was founded in 1884! It made it’s reputation from only selling British goods. It does lots of charity work and works closely with Breakthrough Breast Cancer. Per Una is it’s famous women’s range. For UK department stores, House of Fraser have a 10% student discount code and lots of great offers on top brands. We really like the range at Debenhams and can show you have to get some fantastic discounts on our student guide. Urban Outfitters is like a cooler little sister of M&S! They have a superb range of fashion, a 10% student discount, lovely homeware and even great knickers and pants! Amazon obviously stocks a huge range online and has a great student programme where you can get free Student Prime for 6 months!